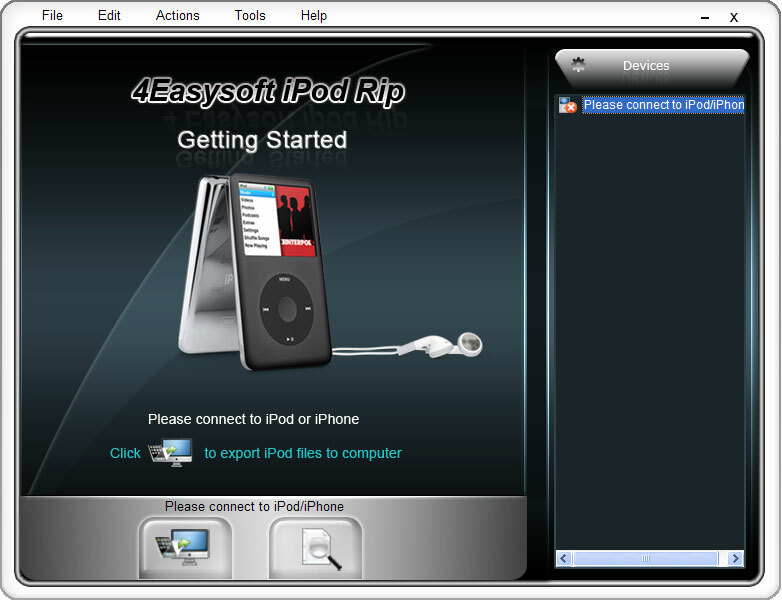 4Easysoft iPod Rip is an outstanding iPod Ripper software, which can rip iPod video to Computer, and copy iPod audio to PC, iPod photo directly without iTunes. Also you can use it to backup iPod files to Computer to avoid your iPod losing or iPod files losing or something else. More, you can display your iPod info automatically, like the iPod type, capacity, version, etc and you can browse your iPod library quickly (Genre, Artist, Album) with it. Now, Now this iPod Rip can also support iPad/iPhone 4G/iPod touch 4 and iOS 4. Easy to backup iPod videos to your Computer directly. Simple to copy iPod songs to Computer without the help of iTunes. Backup iPod photo to Computer. Once you connect your iPod, 4Easysoft iPod Rip can recognize your iPod/iPhone specific information, such as iPod type, iPod capacity, iPod version, serial number, format, and the available space , used space in your iPod. Check &quot;Search&quot; to browse your iPod library, including the Genre, Artist, Album info. 4Easysoft iPod rip is compatible with iPod, iPod nano, iPod classic, iPod shuffle, iPod touch, iPod touch 4, iPhone, iPhone 3G, iPhone 3GS, iPhone 4G, iPad and iOS 4. Two click to finish your iPod video/audio backup. Provide the fastest rip speed to copy your iPod file to Computer.